Balgrendia offers mystery and terror to all who find themselves there, infested as it is with wicked faeries, horrific demons loosed from the Void, and other twisted monstrosities that defy description. The noisome swamps making up its coastlines, along with the dense, foreboding forests covering almost all the region, present natural obstacles few armies have been able to overcome. Thus, Balgrendia remains almost as it has since its first settlement: mostly wild and unsettled, free from outside influence, and subject to the crumbling Empire in name only. This supplement pulls back the veil that shrouds Balgrendia, offering a detailed look at its history, lands, people, and secrets, making it the perfect backdrop for adventures and campaigns. 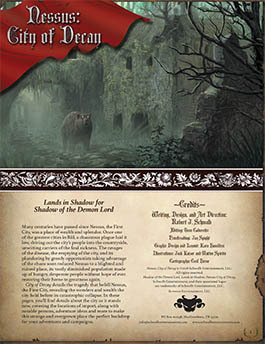 Like other entries in the Lands of Shadow series, A Land of Dreams and Darkness provides you with the information to help bring the region to life, as well as providing players with the details they need to craft characters with backgrounds and connections rooted within the forsaken land. 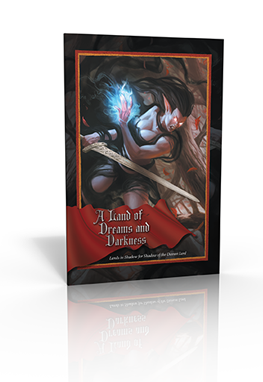 Buy A Land of Dreams and Darkness in PDF at Schwalb Enertainment or DriveThruRPG today! Coming in print soon. City of Decay details the tragedy that befell Nessus, the First City, revealing the wonders and wealth the city held before its catastrophic collapse. In these pages, you’ll find details on the city as it stands now, covering the various locations of import, along with notable peoples, adventure ideas, and more to make this strange and haunted place the perfect backdrop for your adventures and campaigns. Although many believe Nessus to be beyond hope or in its death throes, the First City has not yet surrendered to the long night. 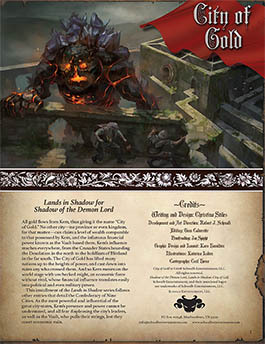 This entry into the Lands in Shadow series offers everything you need to present the city in your Shadow of the Demon Lord games, as well as presenting several new characters, foes, and tools for building the ruins and infesting them with terrors to vex your groups. As well, City of Decay reveals details on the Order of Light, the religion from which the Cult of the New God sprang! Grab your copy of City of Decay on Schwalb Entertainment or DriveThruRPG today! You hear the roar of the crowd before you can see any but the tallest towers. Closer, you see the city’s new outer walls, still half-built and swarming with workers sweating in the swampy humidity. Humans, dwarfs, orcs, and others besides, slaves and free, clamber over scaffolding as the black stone walls rise. Another cacophonous roar splits the air as you pass through the gate, its basalt exterior decorated with reliefs and statues of men and women, gladiators, spilling each other’s blood. The city is near deserted, its buildings of gloomy basalt and brilliantly painted wood and plaster facades empty except for patrolling guards and nervous would-be thieves. Everyone else, human and nonhuman, men, women, and children, are gone, gathered at the giant arena of the Crucible for the grand carnival of violence. The distant crowd screams again. Welcome to Qif, the City of Blood. City of Blood, the latest installment in the Land in Shadow series, lays bare the secrets of one of the most violent city-states on the continent, offering a tour through its blood-stained streets and glimpses of the daily carnage of the fighting arenas. Whether you’re coming for a visit or an extended stay, Qif is not a place for the faint of heart. Pick up City of Blood in PDF from Schwalb Entertainment or DriveThruRPG today! All gold flows from Kem, thus giving it the name “City of Gold.” No other city—no province or even kingdom, for that matter—can claim a level of wealth comparable to that possessed by Kem, and the infamous financial power known as the Vault based there. Kem’s influence reaches everywhere, from the Crusader States bounding the Desolation in the north to the holdfasts of Blötland in the far south. The City of Gold has lifted many nations up to the heights of power, and cast down into ruins any who crossed them. And so Kem moves on the world stage with unchecked might, an economic force without rival, whose financial influence translates easily into political and even military power. This installment of the Lands in Shadow series follows other entries that detail the Confederacy of Nine Cities. As the most powerful and influential of the great city-states, Kem’s presence and power cannot be understated, and all fear displeasing the city’s leaders, as well as the Vault, who pulls their strings, lest they court economic ruin. Buy your copy in PDF at Schwalb Entertainment or DriveThruRPG today! Along the southernmost reach of the Crescent Bay, a jumbled city covers a narrow, jagged peninsula, like a scab that just won’t heal right. The city of Pruul was once a shining jewel with great wealth, power, and influence that equaled or even exceeded the other cities of the Confederacy of the Nine, of which it is a member. But the city’s relentless greed and avarice caused it to tear itself apart, as a tiny minority of rich got richer, and the massive majority of the poor got poorer. In the aftermath of bloody riots that brought down the city’s ruling elite, criminals and other unsavory elements filled the power vacuum as the only form of stability and order. Although a hollow shell of its former glory, Pruul, now known as the City of Thieves, serves as a hub for rogues, pirates, brigands, escaped slaves, debtors fleeing their debts, and a variety of other misfits and miscreants. This installment of the Lands in Shadow series provides a lawless place with its own dangerous and obscure rules—a city where anyone with sharp wits and a sharper knife can carve out their own destiny. As with the other installments in this series, the information presented here serves as a starting point for bringing the city to life in your game. The details provided are intended to spark your imagination for customizing the setting to your liking, and you should certainly change anything you see fit in order to make it your own. 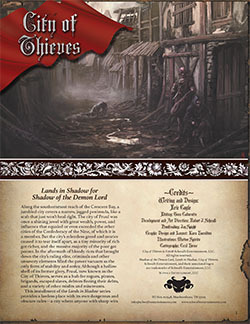 Buy City of Thieves in PDF on Schwalb Entertainment or DriveThruRPG today! You asked for it and now you have it! We’re proud to announce that A Land Divided is now available in print exclusively from DriveThruRPG! Long before the Empire, created by the Kalasans after they stormed Rûl and wrested it from the clutches of the dread Witch-King, whose wicked legions had overwhelmed and plunged the continent into darkness, an ancient people known as the Edene ruled over the land. Like the Kalasans so many centuries after them, the Edene were also bold conquerors who arrived on the shores of the continent, fleeing the destruction of their homeland far across the Auroral Ocean, They arrived in Rûl, handily defeating the First People and their faerie allies who had called the continent home for centuries, and founded a new civilization in the ruins of the one that came before. The Edene claimed their empire would last a thousand years, but like so many fledgling empires since the dawn of time who believed the same, the Edene themselves were drowned in the ebbing and flowing tides of history, yet another civilization of grand ambition lost and mostly forgotten. Ruins and remnants of the ancient Edene still litter the lands of Rûl. One can find their works across much of the Empire, from crumbling castles jutting up from the high hills of the Holy Kingdom, to broken statues and indecipherable cenotaphs scattered about the countryside surrounding Caecras. A revealing glimpse into this civilization can be obtained more easily that one might think simply by traveling east to the newly independent kingdom that calls itself Old Edene. This entry into the Lands of Shadow series explores this kingdom, built in no small part upon the values, traditions, and cultural artifacts of the Edene civilization that once existed before it was nearly wiped out by the Witch-King. Here you will find information about the history, peoples, and major figures of contemporary Old Edene to help you explore these lands in your own Shadow of the Demon Lord campaign. 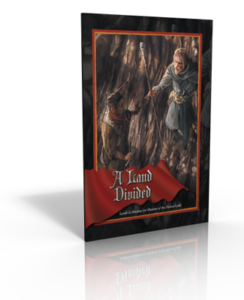 Grab a copy of A Land Divided from Schwalb Entertainment or DriveThruRPG! A print edition is coming soon! 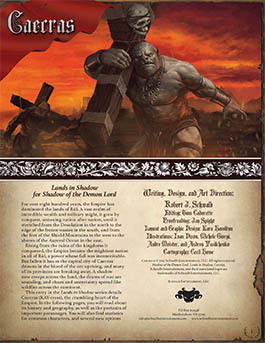 We’re proud to announce that Kingdom of God for Shadow of the Demon Lord is now available in print exclusively from DriveThruRPG! As the Empire crumbles, cultists emerge from the shadows to work their wickedness in plain view, the undead armies in the Desolation gather strength and numbers, and signs of the coming doom become more widespread. In these troubled times, all eyes look to the Holy Kingdom for salvation. This holy land has been the spiritual heart of the Empire for centuries, shining like a beacon through the gathering darkness. Surely, of all places on Rûl, the Holy Kingdom should be the best hope for the future against the apocalyptic times being foretold in by the troubles besetting the land. Surely, the Holy Kingdom will rise to the challenge and gather to its banners the other provinces to crush the orc uprising and restore order to the land. Or will it? Kingdom of God reveals the details of one of the Empire’s most important provinces, offering a look at its history, lands, and people. 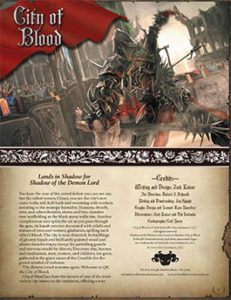 In addition, this entry in the Lands in Shadow series offers a selection of new paths for characters, whether in service to the New God or in opposition to the cult. 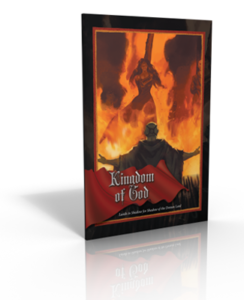 Buy Kingdom of God in PDF here or on DriveThruRPG! An imperial backwater by almost any definition, Low Country earns its importance by being the Empire’s breadbasket. Widely regarded as a sleepy place where little happens, Low Country hides its share of secrets and intrigues, especially now as the Empire unravels. Thanks to the tireless efforts of halfling settlers, Low Country has shaken off its origins as an uninhabited wilderness to become an agricultural powerhouse. Ostensibly still loyal to the Empire, despite the orc-king Drudge sitting upon a usurped Alabaster Throne, Low Country’s hard-working halfling farmers continue to keep the rest of the Empire fed. For how much longer, no one knows. 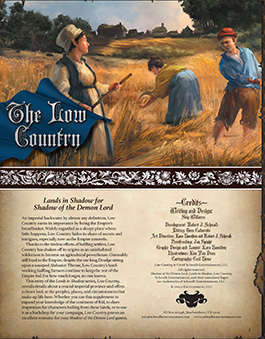 Low Country, a new entry of the Lands in Shadow series, reveals details about a crucial imperial province and offers a closer look at the peoples, places, and circumstances that make up life here. 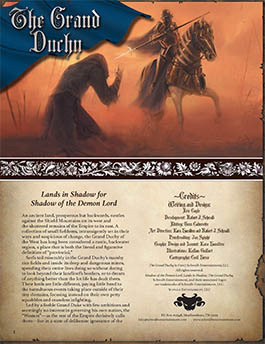 Whether you use this supplement to expand your knowledge of the continent of Rûl, to draw inspiration for characters hailing from these lands, or to use it as a backdrop for your campaign, Low Country proves an excellent resource for your Shadow of the Demon Lord games. Pick up Low Country in PDF from Schwalb Entertainment or DriveThruRPG today! For over eight hundred years, the Empire has dominated the lands of Rûl. A vast realm of incredible wealth and military might, it grew by conquest, annexing nation after nation, until it stretched from the Desolation in the north to the edge of the frozen wastes in the south, and from the feet of the Shield Mountains in the west to the shores of the Auroral Ocean in the east. Rising from the ruins of the kingdoms it conquered, the Empire became the mightiest nation in all of Rûl, a power whose fall was inconceivable. But fallen it has as the capital city of Caecras drowns in the blood of the orc uprising, and many of its provinces are breaking away. A shadow now creeps across the land, the drums of war are sounding, and chaos and uncertainty spread like wildfire across the continent. This entry in the Lands in Shadow series details Caecras (KAY-cress), the crumbling heart of the Empire. In the following pages, you will read about its history and geography, as well as the portraits of important personages. You will also find statistics for common characters, and several new options for player characters. With Caecras, you have everything you need to explore the ruined capital, and make it the centerpiece of your Shadow of the Demon Lord campaign. Buy Caecras from Schwalb Entertainment or DriveThruRPG today! An ancient land, both prosperous and regressive, nestles against the Shield Mountains to the west and the shattered remains of the Empire to the east. A collection of small fiefdoms, long set in their ways and suspicious of change, the Grand Duchy of the West has long been considered a backwards, rustic, and ignorant place. Serfs toil in the fields and mines, hunt and grow rice in the dangerous, brackish marshes, and spend their lives never looking beyond their ruling lord’s border or dreaming of anything better than their lot. Lead by a feeble Grand Duke with few ambitions and even fewer ideas, Westers live in a self-induced blindness to the dangers of the outside world or the seeping, insidious corruption that infects the very land. With the remains of the Empire in turmoil, The Grand Duchy sits back to relish days of old that never truly existed. It is a land ripe for unforeseen shock and upheaval. Buy The Grand Duchy from Schwalb Entertainment or DriveThruRPG today!